My book of invention ideas seems to be selling well, about two thirds through the 1000 printed. I had a lovely comment from Thomas Heatherwick, designer of the London olympic cauldron amongst other brilliant things. 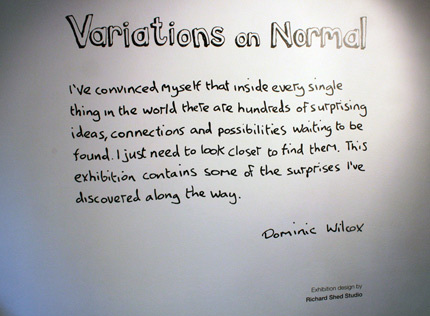 He kindly wrote, “Dominic Wilcox’s drawings aren’t just witty and beautifully drawn, they are serious challenges to the real world to keep looking at itself with innocent eyes, wondering what else is possible” He mentioned a favourite of his was the motorised ladder below. 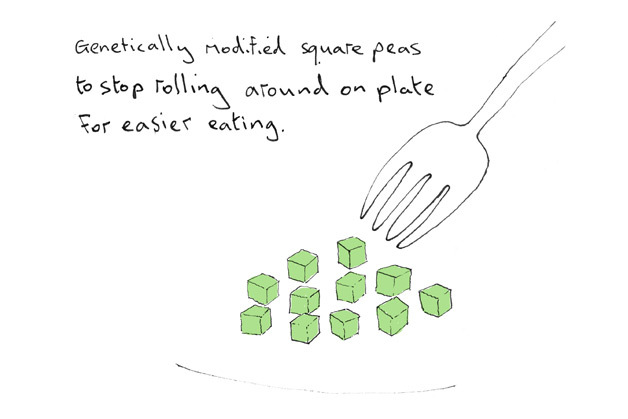 Christmas is nearly here and if you want gifts to keep your relatives entertained after their Turkey why not buy my signed book Variations on Normal HERE for only £8 so I can buy myself a Christmas pudding. Worldwide delivery is no problem but be quick for the post before christmas. I must make more effort putting it into shops but it is available in London at Magma near Covent Garden, Artwords on Broadway Market, Theo at Somerset House arcade, The Serpentine Gallery book shop and in Edinburgh at Analogue Bookshop. 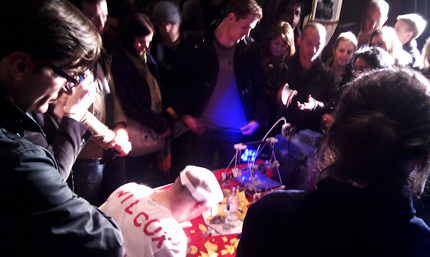 Or how about my Sounds of Making in East London vinyl record with mp3. See here. 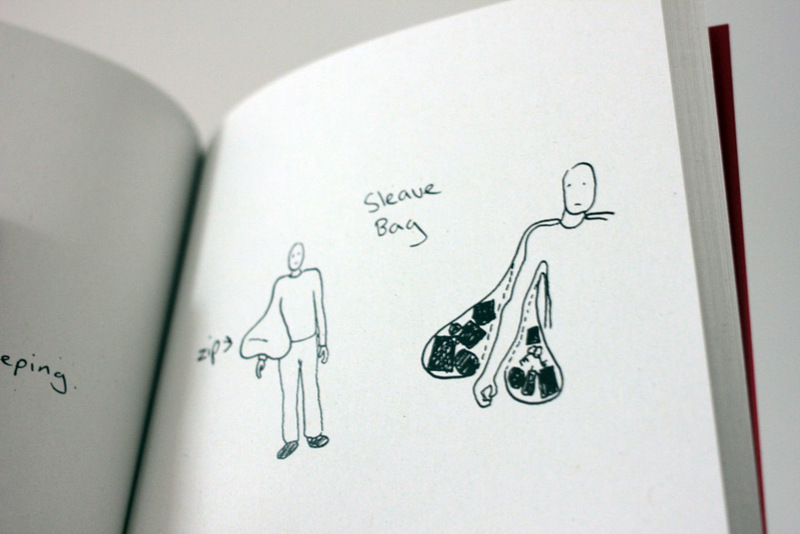 I have put together over one hundred of my odd yet strangely logical invention drawings into a little book. You can see some of the ideas below. They all come from a room inside my head that I like to go to every now and again. A signed book can be bought for the bargain amount of £8 on my web shop here. I’ve had 1000 printed and they seem to be selling fast. In addition to the book I made a little animation by connecting some of the book’s ideas into a mini story. Hope you enjoy. Also if you are in London come down to KK Outlet where I have an exhibition on. I was commissioned by the Global Footprint project in Northamptonshire, a place famous for shoe making, to create some shoes. 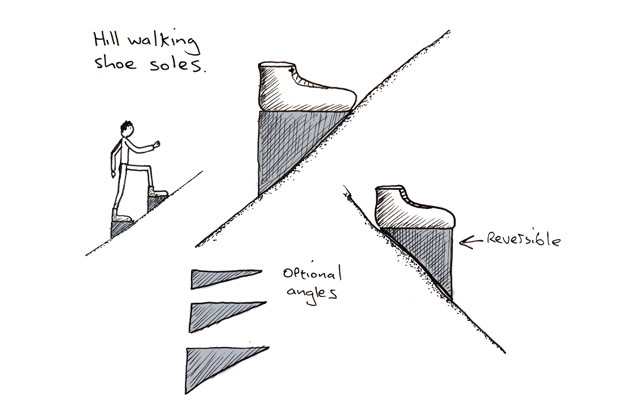 I decided to make a pair of shoes that can navigate you wherever you wished, no matter where you are in the world. I thought about the Wizard of Oz and how Dorothy could click her shoes together to go home. After uploading your required destination to the shoes via a piece of custom made mapping software and a USB cable, the GPS, which is embedded in the heel, is activated by a heel click. 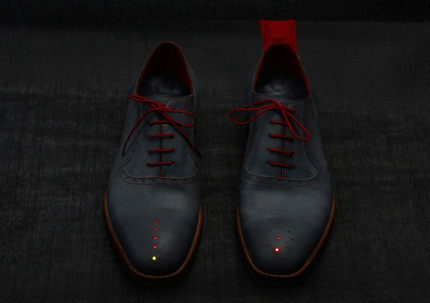 It then communicates to the wearer via a ring of LED lights to point in the required direction. 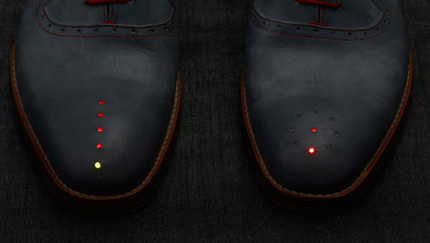 The shoe with the GPS wirelessly communicates with the right shoe that has a progress bar of lights to show how close you are to the destination. 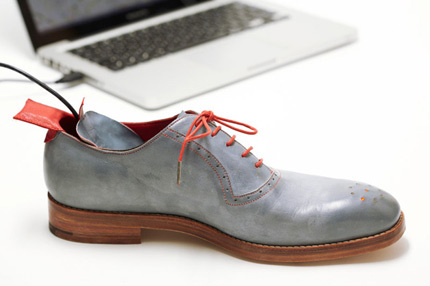 The Shoe is connected to a laptop with the mapping software. 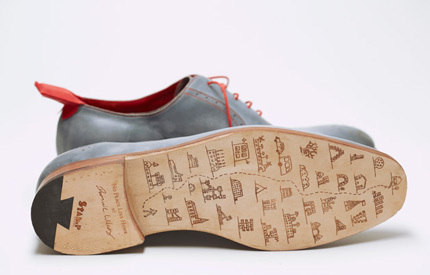 The user plots their destination on a map and uploads it to the shoe. The USB connection also charges the battery in each shoe. The progress bar starts with one red light at the beginning of the journey and ends on the green light when you arrive. The correct direction to walk is shown by the illumination of one of the LED’s on the circle. I made an illustration that was etched onto the soles. The red leather and stitcing is a little reference to Dorothy’s red ruby shoes. 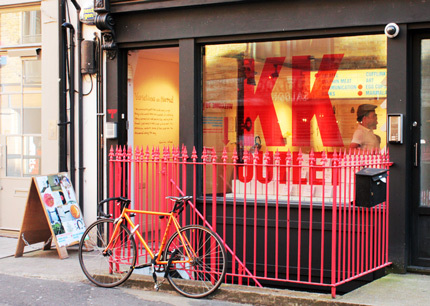 I have an exhibition of my work on at KK Outlet gallery, London, running until the 26th of September. 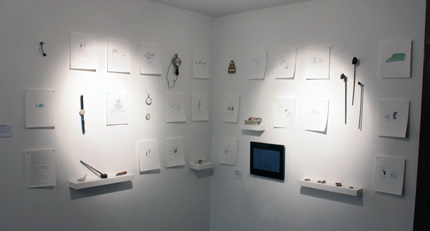 I’ve got new work never seen before on show as well as recent and past work and all my videos. 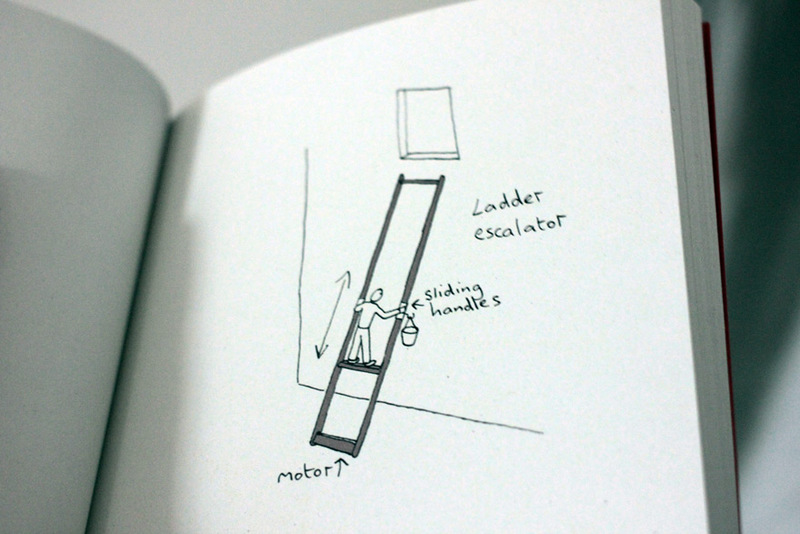 I’ve even launched a book of my invention drawings and an animation. So it’s been very busy recently. The show is open all through the London Design Festival and should be mentioned in the guides. 9 – 6pm Monday Friday, 12 – 5pm Saturday. One of the things I’m showing is a personal collection of oddities that I own. For example on the left is this WW2 Japanese Airforce ceramic fire extinguisher. Designed to be filled with sand and thrown out of an airplane on to fires caused by bombing below. I was told by the previous owner that the technique wasn’t very effective. Next to it is a wedgewood teapot that can lean back to use its internal tea leaf strainer. 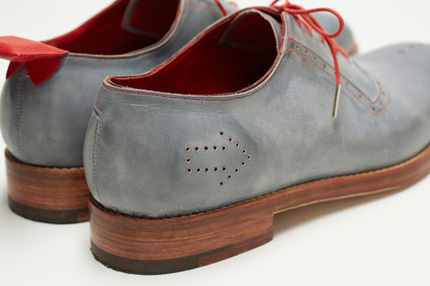 I also have a pair of shoes that can guide you home to post about soon and an animation and book. With thanks to Richard Shed Studio who designed the layout, graphics and design of the exhibition. Sounds of Making on the airwaves. I decided to focus on what makes East London unique, the large amount of skilled, creative and historical makers that live and work there. I visited 21 makers in East London and recorded the sounds of them at work. Examples included the clatter of lyric poet John Hegley’s typewriter, the chopping of garlic in a Michelin star restaurant, the tap of rock ‘n’ roll cobbler Terry de Havilland’s hammer and the sound of a bell being tuned in Britains oldest manufacturer. I then found a vinyl record company in Hackney who cut and manufactured the record. Then I drew some of the tools and the makers for the record sleeve and added the track descriptions on the back. The record is now available to buy for £15 and includes an mp3 download code. When I visited the makers I also took photos and I did 10 interviews. I decided to create a website that would document all of the project. www.soundsofmaking.com I hope you enjoy visiting it. Now I sleep. 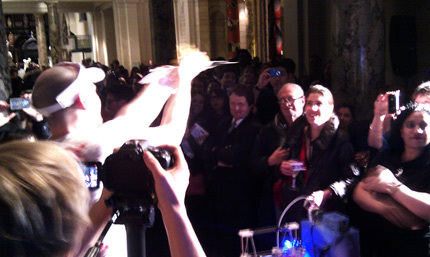 After my triumphant victory over the 3D Printer in Milan I returned to home turf to compete against a new printer at the Victoria and Albert Museum in London during their monthly Friday Late event. This time I competed against a machine from A1 Technologies. I decided that we should both make a model of St Paul’s Cathedral. 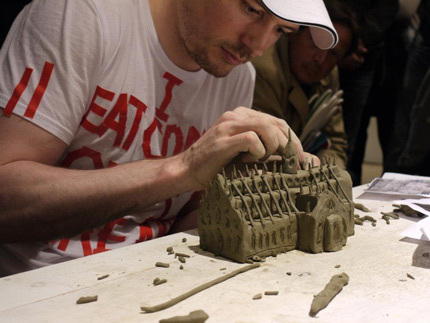 In Milan I used clay to make the Duomo but this time I thought I would try marzipan just to make it more difficult for myself and get closer to potential public humiliation. I was a little surprised at the size of the crowd as I came out from behind the curtain after we were introduced. Curator extraordinaire Beatrice Galilee gave running commentary on the event, highlighting such dramas as the fact I seemed to be struggling to get into the marzipan packet. The maripan got softer as the heat rose so it was a bit of a challenge to make a Cathedral. 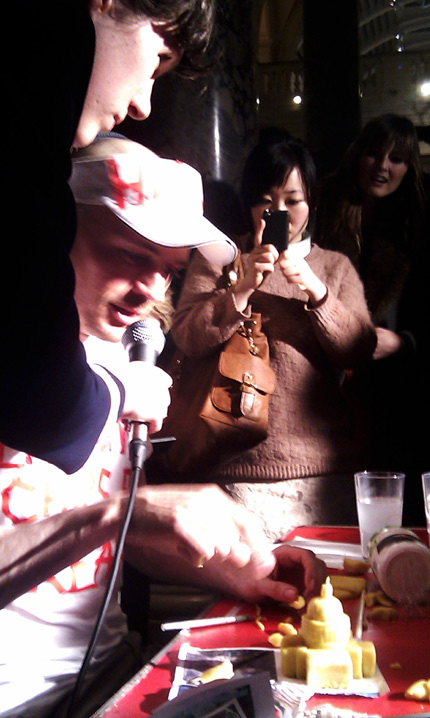 The vote was put to the crowd and they thought I had won (most likely out of sympathy). Improvised making in Milan …. As part of the Making Together exhibition in Milan I had invited the public to donate sticks of all types and sizes which I planned to tape to a chair and build a network of sticks during six days of Milan design week. 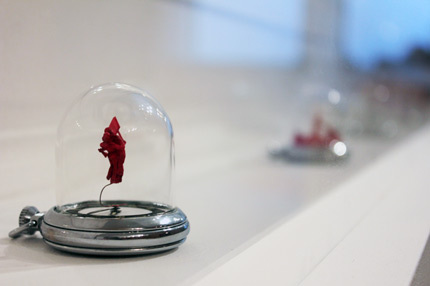 It was to be an improvised creation where I would decide how it would grow while I was making it. It’s quite exciting to start from nothing and not be sure what is going to happen, particularly when in front of an expectant on looking audience. The chair and some sticks were waiting for me when I arrived with my tape. I started attaching the sticks to the chair. I placed a spotlight I found at the exhibition and pointed it onto the white wall to create shadows. The idea I came to Milan with was to build a bridge of sticks between two chairs but I changed my mind and wanted to build on one chair with only the legs of the chair touching the ground. I wanted to see how far I could push the strength of the tape and balance of the chair. I decided to draw the shadow onto the wall with the same tape. On the third day I was told that the chair had toppled over in the night and so I strengthened with more tape. I added a chair on one side to try to balance out the weight. Sometimes I would come into the room and some members of the public were attaching stick to the ‘tree’. This wasn’t part of my plan but I was tempted to see what they did. Collaboration with the public can be interesting but it is important that they understand the rules and restrictions of what needs to be done. I ended up having to remove the 5 or 6 additions as they weren’t strongly taped or in the best positions for a good structure. I decided to continue with just me adding things but the public bringing the sticks throughout the day. The shadow moved continuously due to the weight of new sticks being added, but I just drew over the new shadows. At the end the stick structure was moved to a new room leaving the shadow drawing as a permanent piece. 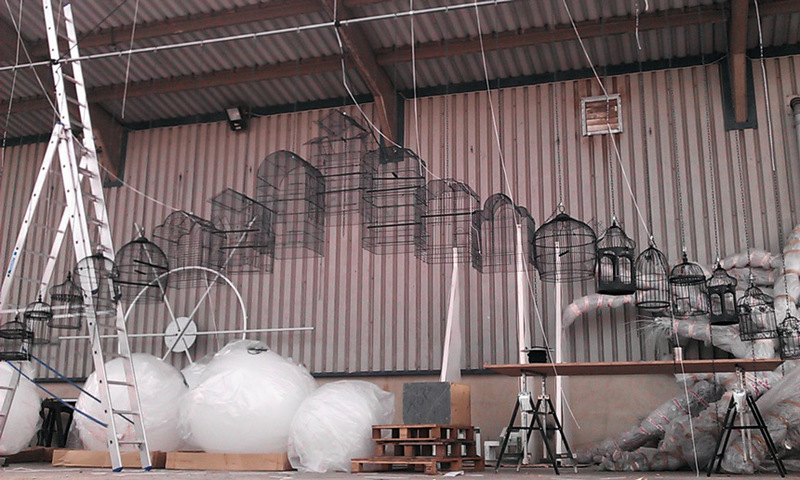 See the other project I did in Milan, a competition against a 3D printer to make a cathedral, man vs machine here. )Update to the below: Rematch at the V&A see here ). I won the battle of Man vs Machine in Milan at the Hacked event at La Rinascente department store! 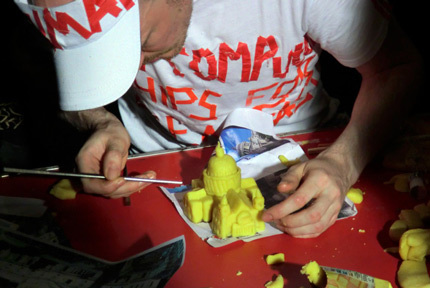 The challenge was for me and a 3D Printer to make the best model of the nearby Duomo cathedral within 1.5 hours. 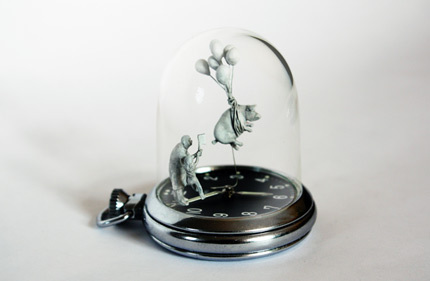 The age of 3D Printing is here but there is a discussion around where it is heading and how useful it will be. What can a human do that a machine can’t? Can the hand created object give something that a computer cannot? Or can machines do everything better? Is computerised perfection emotionless? There was a big crowd and many people stayed for the whole time watching the progress intensely. The clock counted down for 90 minutes, there was a little beep for every second which made me nervous. (No Plugs) I bought a white dressing gown like the boxers and added some messages with red tape I was using in my other exhibition. We came out to the sound of the Rocky theme music. I took some photos of the Duomo but when I started I found it difficult to remember what shape it was. There were many people around photographing and filming and for a few minutes I was thinking ‘what am I doing?’. However once I had made the first blocks I could see potential in the model and I focused on my task. I was hearing that the 3D Printer had a little problem half way through, the model was moved a little and started printing slightly to the side, but it was fixed. The real Duomo has many details and the makerbot 3d printer is quite a simple but a fun DIY style machine. The Editor in chief of the italian magazine Domus Joseph Grima was the referee and decided to award the prize to me. The prize was a large ceramic ‘subbuteo’ of football team AC Milan. ‘I eat computer chips for breakfast’ Me and the We Fab team from Milan. Thanks to curator Beatrice Galilee for the Hacked event she invited me to, referee Joseph Grima and wefab.it for their enthusiasm and skills. 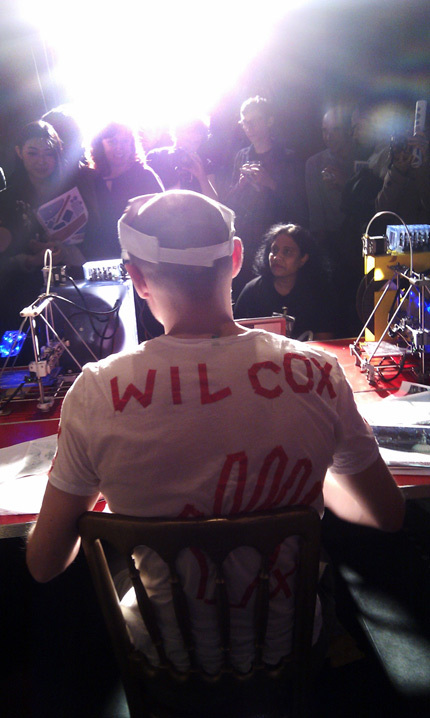 There is talk of another match in London very soon with a different 3D Printer. This could be an event the grows and develops. Keep following. See the other thing I made in Milan here with tape, sticks and a chair here. During this year’s Milan design week I will be spending 6 days at the Making Together event in Ventura Lambrate. The theme of the event is participation and collaboration and I was asked to come up with an idea of what I could make there. 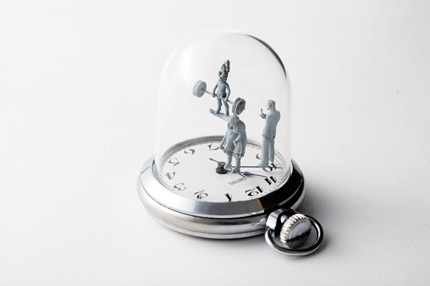 My project is titled ‘Between your thoughts and mine’ and attempts to symbolise the connection between two people sharing their knowledge and ideas. It is inspired by the knowledge that our mind holds all the things we’ve ever seen and experienced, and ideas come about by linking these apparently unconnected things together. My plan is to attempt to build a tree like network of sticks and stick shaped, everyday objects, attached to two chairs using duct tape. The public (that’s you my friend) are invited to bring sticks that can be added to the structure including brushes, walking sticks, a flute, a tennis racket in fact anything that has a stick shape is welcome. 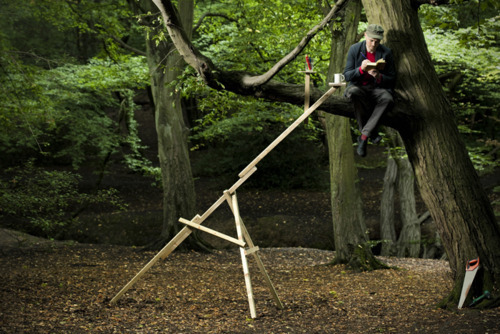 This completely improvised method of making has an unpredictable outcome, it will start by me attaching a stick to a chair leg with some tape and then continuing to build upwards, connecting stick to stick. 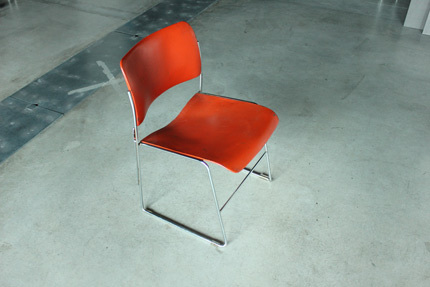 My aim is to try to connect the stick networks of two chairs together to create a bridged ‘conversation’ between them. The only parts touching the floor are the chair legs. I asked the organisers to find two chairs and some sticks to get started and then ask the public to bring their own sticky things to add to it. I have no idea what this will turn out like in reality but something will happen. If you are in Milan pop in and say hello (and bring a sticky thing). Edit. The idea was influenced in part by my earlier door stop extension idea I did during my Speed Creating project. April 17th – 22nd 2012. 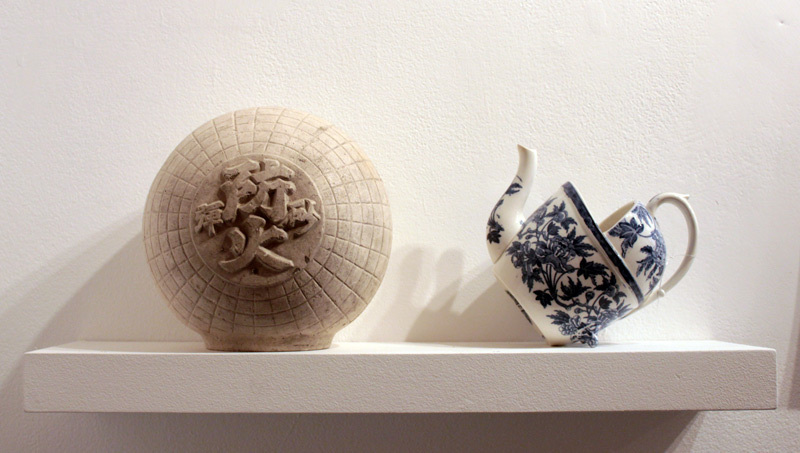 To mark the 10th anniversary of the War Bowl I have created two new limited edition versions. 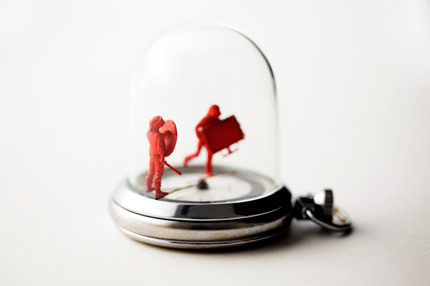 The red Battle of Waterloo bowl is made with melted British Artillery and French Infantry figures. The black English Civil War bowl uses Royalists and Republican figures. The War Bowls, together with limited edition prints of my invention drawings and anti-theft rust bike stickers are available online here here . The War Bowl is hand made in small numbers, each bowl is stamped on the base by me with the date. Each bowl is unique due to it’s hand made nature and comes with a loose set of the soldiers that were used in it’s creation. The new red and black bowls are limited to an edition of 250 each. I have a new big project to show. 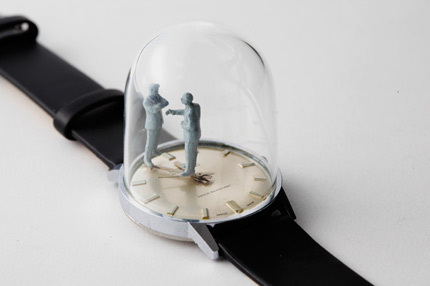 I’ve put tiny figures onto watch hands in order to create mini animated scenes. I had the idea last year during my Speed creating project, but decided it was too good to rush. 8 month later I showed a prototype to Dezeen and they commissioned me to make a collection. 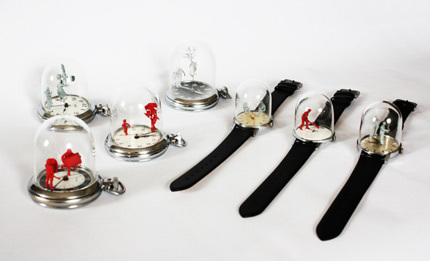 The watches use customised model figures and I also made objects, like a miniature looted LCD tv. The glass domes were specially made to fit by Wearside Glass Sculptures in my home town of Sunderland at the National Glass Centre. 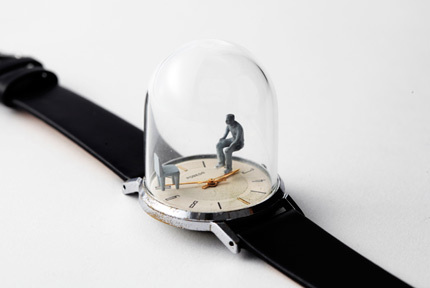 The watch sculptures will be exhibited at Dezeen Space in Shoreditch, London from 17 September to 16 October. 54 Rivington Street, London EC2A 3QN. London Looter: I had to walk across Mare st in Hackney to get home during the riots. I remember seeing a boy carrying a lcd tv down a back st. I noticed how the police seemed unsure how to react, holding their circular shields while the boy held a rectangular tv. Adventures of a young vegetarian : a small girl attempts to stop a butcher chopping up a pig by hanging on his arm while the pig floats away. The Sitting man: A man sits for a moment. 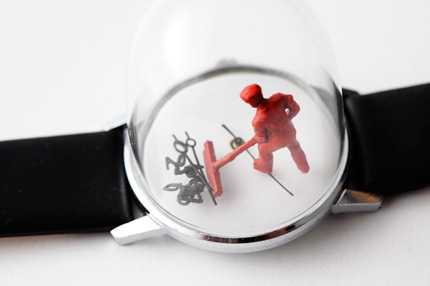 Watch sweeper: the numbers and hands are swept away on the second hand. A man so engrossed in his iphone that he fails to notice a monkey balancing on the head of a weightlifting boy on the arm of an elderly roller skater. One man stands with arms folded while another moves around in continual hope that his hand will be shook. This photograph was taken by photographer Joe McGorty for an article about me in this month’s 100th edition of icon magazine. Since my studio can be anywhere, I decided to make a Tree Branch Work Desk to enable me to think up a tree with a cup of tea and pencils at hand. We decided to document the making of the desk as seen in the animation put together by Joe. Personally I quite like their current look but here is my idea to solve two issues in one, the fact that we are running out of landfill space and the desire for pylons that preserve the beauty of our countryside. They could even be built around existing pylons so are low cost. Alternatively just rename pylons, Mini Eiffel Towers and the public will adore them, maybe even pay to go up them. This is an alternative to my idea I did a while back for hill covered tower blocks. I am happy to say that this website VariationsonNormal.com has been nominated for a prestigious Webby award in the Personal website/blog category. If you like my website it would be wonderful if you could take a minute to vote for this site here. The Webby Awards are often described as the Oscars for websites and are now in their 15th year. For new visitors, VariationsonNormal.com is where I put my sketchbook ideas and experiments. On the left you can see a list of categories for easy navigation. 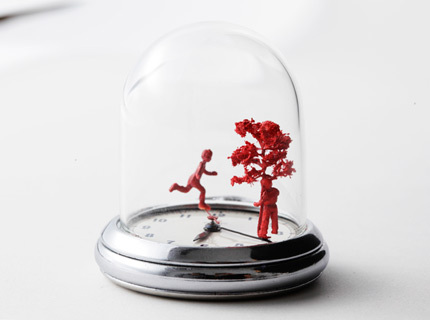 Recently I completed a project called Speed Creating where I made something creative each day for 30 days. Save space in the graveyard, use the tomb stone as a screw handle. This is a drawing I showed back in september 2008 in the design and architecture magazine Icon. Follow me for new things on twitter or facebook. Moving on from the previous idea here we have a motorised ladder. How technology can save you serious money. 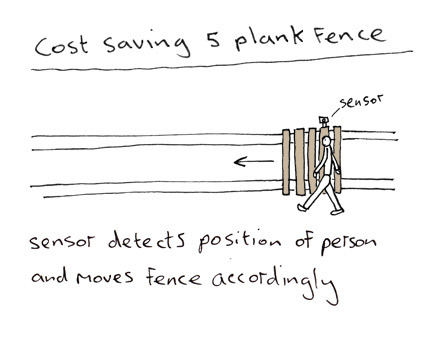 You might be asking ‘why hasn’t anyone thought of this before?’ But the garden fence industry is very powerful and they kill any idea that would threaten their plank quantity sales. When I was twelve, while lying in bed, I worked out how to make a perpetual motion machine. This would solve all the world’s energy problems, I fell asleep in the excitement of planning how I would spend the profits. When I woke up I realised that I had forgotten what my idea was. I apologise. I’m frowning in regret as I write this even today. However, now in the age of the internet I can quickly put my ideas on this website so that the world can reap the rewards before I forget. This idea was first shown in Icon magazine, 2008 in my ‘Lost sketchbooks’ series. Follow me on twitter or facebook.